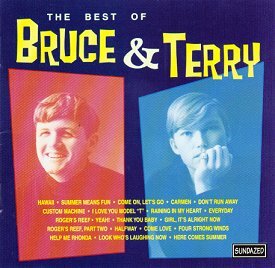 Discuss, review, and rate The Best of Bruce & Terry, released August 1998.
contains some unreleased stuff, too. Can anybody tell me the title of the bonus track from this CD which sounds exactly like the music to Little Deuce Coupe but with different lyrics that sound like they're singing "Mrs. Fabulous Kim, Number One In The West". This hidden track sounds like it could be a theme to a TV Show or something. It's only 35 seconds long (at the very end of the disc from Sundazed). Thanks. It's a radio station jingle for KRTH, I would guess. Great! Thanks for clearing that up AGD! Makes total sense now. East Coast radio stations begin with W, not K, so I thought they were singing about a fabulous girl named Kim, LOL!